After Christmas we are all guilty to over indulge, and we set ourselves little targets to start or rekindle our love with a healthy lifestyle. Trying new foods, and cutting out the bad ones we can be well on our way to getting that desired lifestyle we are looking for. But with all this altering of diets and lifestyle. We want to look good too and Damart’s Athleisure collection is just the place for you to go. We all set resolutions for New Years and with that we can help you with easy work out routines to help you keep those Christmas pounds at bay. Our recent blog post will be your guide to keeping fit – click here. Athleisure is a trend that keeps popping up within the fashion world, and now is the perfect time to invest in some essential pieces to work alongside your resolution for a healthy lifestyle. We have put together some easy essentials that you can pull together to ensure you feel great and hitting 2019 with an impact! Whether it is a casual walk or excercise with more intensity- these items are perfect for any activity. The Zip Jacket and stretch printed jeggings are brand new this season, they are made from a lightweight fabric perfect for any activity- both a regular fit allowing you to feel comfortable at all times. Heading on a day out or long walk? Be sure to grab out Packable Backpack, only £14.50, with zip fastening it easily packs away into a small bag for your ease. 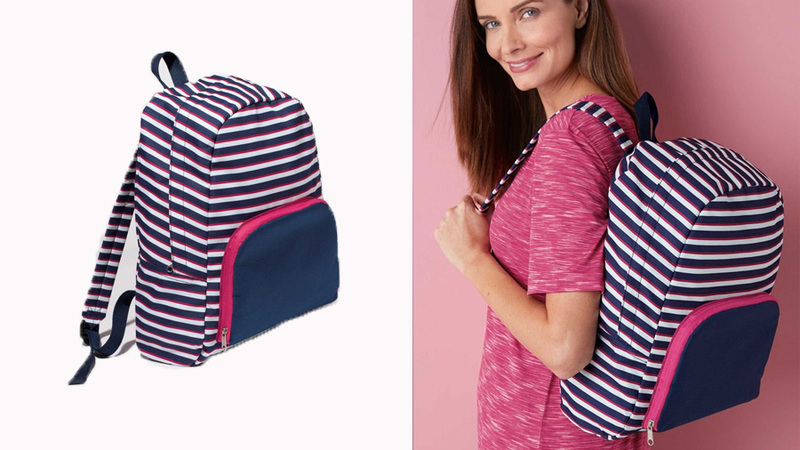 In a stylish nautical stripe it is a handy additon to your outfit- pack away healthy snacks and a bottle of water to ensure you remain hydrated when working out. Be sure to head over to Damart to shop the whole Athleisure collection and have a healthy 2019!